Make this Chocolate Fantasy a part of your holiday gifts or thank you giveaways for a memorable sweet reward. Dimensions: 10 11/16" x 3 7/8" x 2 3/16"
Price includes imprint foil-stamped in white on brown satin ribbon. 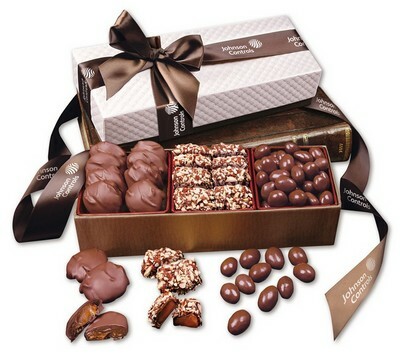 Indulge someone's love of fine chocolate with this sumptuous gift! Three award-winning confections... our signature English Butter Toffee, mouth-watering Pecan Turtles and rich Chocolate Covered Almonds presented in an elegant white pillow-top gift box. It's carefully tied with complementary brown satin ribbon that's foil-stamped with your logo in white. They'll love you for choosing this sophisticated gift!